The son of a surgeon and one of seven siblings, he was born on July 22, 1955 in Appleton, Wisconsin. Dafoe began acting as a teenager, and at the age of seventeen he enrolled at the University of Wisconsin in Milwaukee. Growing weary of the university's theatre department, where he found that temperament was all too often a substitute for talent, he joined Milwaukee's experimental Theatre X troupe. After touring stateside and throughout Europe with the group, Dafoe moved to New York in 1977, where he joined the avant-garde Wooster Group. Known for the darkly eccentric characters he often plays, Willem Dafoe is one of the screen's more provocative and engaging actors. Strong-jawed and wiry, he has commented that his looks make him ideal for playing the boy next door -- if you happen to live next door to a mausoleum. Dafoe's 1981 film debut was a decidedly mixed blessing, as it consisted of a minor role in Michael Cimino's disastrous Heaven's Gate . 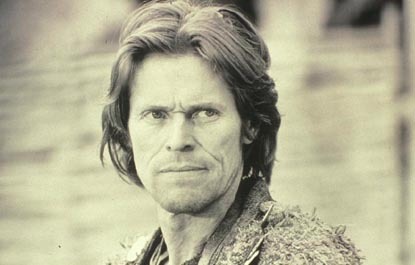 Ultimately, Dafoe's screen time was cut from the film's final release print, saving him the embarrassment of being associated with the film but also making him something of a nonentity. He went on to appear in such films as The Hunger (1983) and To Live and Die in L.A. (1985) before making his breakthrough in Platoon (1986). His portrayal of the insouciant, pot-smoking Sgt. Elias earned him Hollywood recognition and a Best Supporting Actor Oscar nomination. Choosing his projects based on artistic merit rather than box office potential, Dafoe subsequently appeared in a number of widely divergent films, often taking roles that enhanced his reputation as one of the American cinema's most predictably unpredictable actors. After starring as an idealistic FBI agent in Mississippi Burning (1988), he took on one of his most memorable and controversial roles as Jesus in Martin Scorsese's The Last Temptation of Christ (1988). Dafoe then portrayed a paralyzed, tormented Vietnam vet in Born on the Fourth of July (1989), his second collaboration with Oliver Stone. Homicidal tendencies and a mouthful of rotting teeth followed when he played an ex-marine in David Lynch's Wild at Heart (1990), before he got really weird and allowed Madonna to drip hot wax on his naked body in Body of Evidence (1992). Following a turn in Wim Wenders' Faraway, So Close in 1993, Dafoe entered the realm of the blockbuster with his role as a mercenary in Clear and Present Danger (1994). That same year, he earned acclaim for his portrayal of T.S. Eliot in Tom and Viv, one of the few roles that didn't paint the actor as a contemporary head case. His appearance as a mysterious, thumbless World War II intelligence agent in The English Patient (1996) followed in a similar vein. In 1998, Dafoe returned to the contemporary milieu, playing an anthropologist in Paul Auster's Lulu on the Bridge and a member of a ragingly dysfunctional family in Paul Schrader's powerful, highly acclaimed Affliction. He then extended his study of dysfunction as a creepy gas station attendant in David Cronenberg's eXistenZ (1999). After chasing a pair of killers claiming to be on a mission from God in The Boondock Saints, Dafoe astounded audiences as he transformed himself into a mirror image of one of the screens most terrfiying vampires in Shadow of the Vampire (2000). A fictional recount of the mystery surrounding F.W. Murnau's 1922 classic Nosferatu, Dafoe's remarkable transformation into the fearsome bloodsucker had filmgoers blood running cold with it's overwhelming creepiness and tortured-soul humor. After turning up as a cop on the heels of a potentially homicidal yuppie in American Psycho that same year, the talented actor would appear in such low-profile releases as The Reconing and Bullfighter (both 2001), before once again thrilling audiences in a major release. As the fearsome Green Goblin in director Sam Raimi's long-anticipated big-screen adaptation of Spider-Man Dafoe certainly provided thrills in abundance as he soared trough the sky leaving death and destruction in his wake. His performace as a desperate millionare turned schizphrenic supervillian proved a key component in adding a human touch to the procedings in contrast to the dazzling action, and Dafoe next headed south of the border to team with flamboyant director Robert Rodriguez in Once Upon a Time in Mexico.